Calgary Reviews/FlickrA meal aboard a Lufthansa flight. 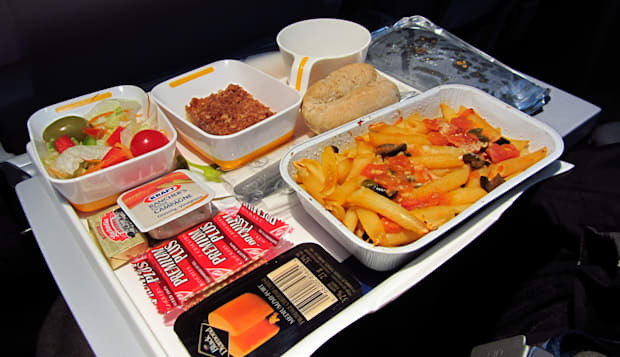 Most people wouldn't voluntarily subject themselves to an in-flight meal under circumstances not involving air travel. But German airline Lufthansa is willing to bet otherwise, with a new delivery service that allows customers to enjoy the pleasures of an in-flight dinner in the comfort of their own home. According to CNBC.com, Lufthansa has joined forces with online supermarket Allyouneed.com, which has reportedly witnessed "a lot" of fliers signing up for the service. The site will deliver a reheatable Lufthansa meal to your doorstep every Wednesday, including this week's special: Chinese beef shin with Indian vegetables. Which actually sounds kind of okay. "Our customers on some days don't want to cook, but also don't want to use convenience products, so we approached Lufthansa to find a solution," supermarket spokesman Max Thinius told CNBC. The service isn't cheap, with meat-based meals running nearly $13 apiece, although it also offers a slightly cheaper vegetarian option at $11.50. The program is set for an eight-week test run, but Thinius expects it to continue for several months, pending its success. No word on whether the meals include a complimentary bag of peanuts.